The Kimbolton estate is thought to have been settled during the era of Roman Britain. Prior to the Norman invasion it belonged to King Harold, and afterwards was gifted to the De Bohun Family. The house, which is built around a courtyard and surrounded by a moat, was begun in the thirteenth century by Geoffrey Fitzpatrick, who had been given permission to hold a market by King John. The house was reduced in the fifteenth century by Anne Stafford, Duchess of Buckingham, and then largely rebuilt in the 1520s by Sir Richard Winfield. In 1615 Kimbolton was bought by Sir Henry Montagu, Chief Justice, Lord Treasurer, and Lord Privy Seal to James I, who was later created Earl of Manchester in 1626. The 4th Earl of Manchester (c1656-1722) (created 1st Duke of Manchester in 1719) was elevated to the Privy Council after the Glorious Revolution, and from c1685 began modernising the interior courtyard at Kimbolton to designs by Henry Bell (1647-1711). This work was halted when Manchester left England on a diplomatic missions to Italy and France, and as such various Tudor and medieval remnants remain in situ. In 1707 the south front collapsed into the moat, and with Manchester away in Venice Lady Manchester turned to Sir John Vanbrugh (1664-1726) to make the necessary repairs. Over the next eight years Vanbrugh rebuilt the south range, and refaced the entire building. Following this, in c1715, a Doric portico was added to the east front by Thomas Archer (c1668-1743) and Alessandro Galilei (1691-1737). It was George Montagu, 4th Duke of Manchester (1737-88) who employed Adam to make designs for Kimbolton in 1763. He was MP for Huntingdonshire from 1761, and on his succession in 1762 became an active member of the House of Lords in support of Rockingham. In the same year he became Lord Lieutenant of Huntingdonshire, Lord of the Bedchamber, and married Elizabeth Dashwood. In 1764 he became a member of the Society of Dilettanti, and was Ambassador to Paris in 1783. Kimbolton was his principal seat. 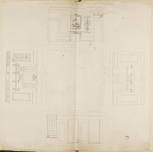 Adam made designs for parts of the interior and various buildings in the park. Unfortunately, however, Manchester was notoriously short of funds. Indeed, it was recorded by Walpole that his income was not adequate to maintain his elevated position, and in 1767 it was necessary for him to sell the Manchester family London house in Berkeley Square to Robert Child. It was presumably owing to these financial difficulties that very few of Adam's designs came to fruition. Of the surviving Adam drawings the only executed designs for Kimbolton were for a cabinet, now in the V&A, and two gateways. A duplicate of one of these gateway drawings (Adam volume 51/89) was sold at Sotheby's in 1987. Alterations were made to Kimbolton during the nineteenth century by Henry Roberts (1803-76), and William Burn (1789-1870). The Manchester family remained in possession of the house until it was sold in 1949 and became Kimbolton School. I am grateful to Edward Valletta, Kimbolton School Bursar, and Nora Butler, Kimbolton Castle Visits Organiser, for sharing advice and information.